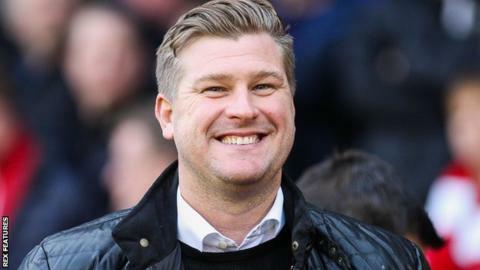 MK Dons boss Karl Robinson wants to strengthen his squad but will not pay "inflated January prices". The Dons beat Northampton 3-0 in Tuesday's FA Cup third-round replay to set up a fourth-round tie at Chelsea. "I'm really going to enjoy the opportunity of delving into the transfer market," said Robinson. "But it's got to be right - I think players are moving for ridiculous money I don't think some of them are actually worth, but January inflates prices." He continued to BBC Three Counties Radio: "I won't get dragged into that and hopefully we can do some business over the forthcoming days." MK failed to break through against the League Two promotion hopefuls at Stadium:MK until the second half, when goals from Ben Reeves, Josh Murphy and Simon Church took them into the next round. But Robinson's side, 20th and two points above the relegation zone, picked up a number of injuries before Saturday's league trip to bottom club Bolton Wanderers. "Nicky Maynard has pulled his hamstring in the build up, we weren't too sure of the extent of it but I chose not to play him," said Robinson. "Dean Bowditch has been ill and couldn't breathe at half-time, went back out and couldn't do it, and Matty Upson's hamstring stiffened up. "When you look at it, on Tuesday everything was against us, Darren Potter's injury, Josh shouldn't really have come on, but we felt we needed to win this game and we didn't want to play Joe Walsh but he had to come on. "It's important now that we recover in the right way and try to get our players ready for probably one of the biggest games of the season on Saturday."